This piece by Assistant Professor of English Dr. Christine Schott appears in the Fall 2015 issue of Inside Erskine magazine. We think she makes a compelling case for why the humanities continue to be relevant to today’s college students. 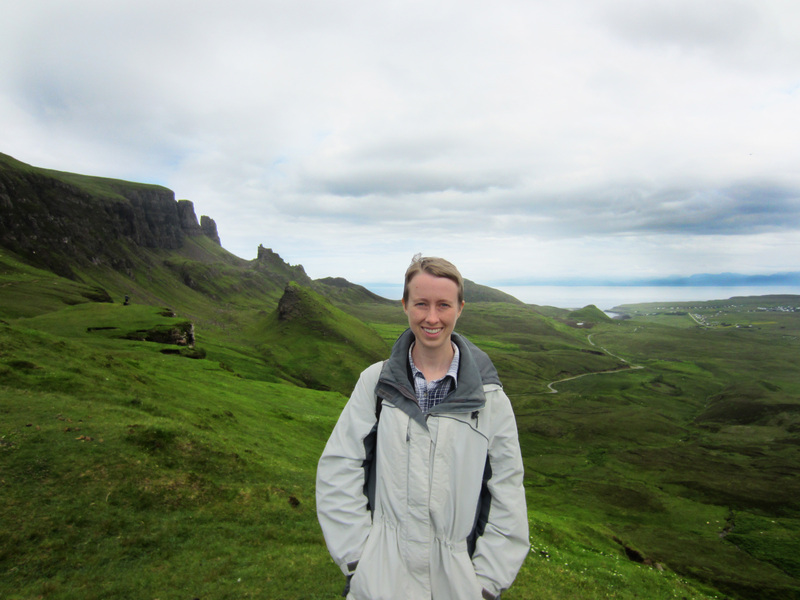 Dr. Schott visited the Isle of Skye this summer as part of her ongoing research into medieval manuscripts and texts. English majors dread being asked what they will do with their degree. Literature professors always say, “You can do anything with an English degree,” and that’s true. But it leaves English majors with no clear path into any one field. This apparent disconnect between degree and career path applies to almost all of the humanities majors—what do you do with a B.A. in history, religion, or philosophy? This has led a practical-minded, vocal sector of the public to question the value of the humanities and even of the liberal arts in general. But as a literature professor, I continue to believe that the humanities are not only still relevant in today’s world but may be more important than ever. English majors, for example, graduate with skills vital to success in any number of fields. They learn, most importantly, to write cogently and communicate clearly both in speech and in print. They learn to look beyond surface rhetoric to analyze motives, biases, and far-reaching implications of what seem at first to be simple situations. These students learn to synthesize information, reconcile conflicting viewpoints, and think outside the box; in other words, they become problem solvers. Despite recent negative press about the humanities, both media and employers are gradually coming forward to point out that humanities majors are desirable in a wide variety of fields—especially in leadership—because they have these vital transferrable skills. But humanities majors have more to offer the world than their services as employees. I point out to my students that studying literature makes them better consumers (because they learn to recognize bias in advertisement), better citizens (because they learn to cut through political rhetoric), and better human beings (because they learn what it actually means to be human). Find yourself thinking the poor are just lazy and ignorant? Read John Steinbeck’s Grapes of Wrath. Having a hard time understanding why anybody would hold to a system of beliefs different from yours? Read Yann Martel’s Life of Pi. Think technology alone has the potential to solve the world’s problems? Read just about anything by Orson Scott Card or Ray Bradbury — or for that matter, watch the Terminator movies; film and literature are just different forms of the same endeavor. Reading literature changes us: it might make us angry by exposing injustices that we had previously been able to ignore, or it might make us uncomfortable by challenging our assumptions about right and wrong, “us” and “them,” but it makes it impossible for us to stay the same. Once you see the humanity of people you had never thought about before, it becomes a lot harder to hate them. And when it becomes harder to hate, then it becomes easier to care. And if there’s one thing this war-torn, contentious world has too few of, it is people who care for others, even those they do not know, simply because we are all human. The truth is that a humanities education is beneficial in every life calling, from stay-at-home parent to president of the United States. English majors do not need to defend their course of study to make it relevant; it already is. And they do not need to change their major to be employable; they only need to augment it. There is no fundamental conflict between the humanities and “practical” education. In fact, in the coming generation, I hope we will see the liberal arts increasing in cultural and market value as employers, educators, and students alike recognize how much the world still needs the humanities. I would just like to say that I adore going to a liberal arts college. There is little more exciting [at least for me] than making endless connections among disciplines and having the pieces fall into place. For example: a world civ lecture on Greek philosophers the other day helped me figure out how to finish a paper on Rousseau for my Family Theory class. A couple of days later, an American Government lecture on Calvinism helped put Rousseau in context even better for me. I constantly find overlaps with psychology and every other subject. I also love just learning. In my Sensation & Perception class, we have been discussing the psychophysiology of the brain as it relates to vision. I now walk around campus thinking about how the parts of my eyeballs, the optic nerves, and all of the various areas of my brain are constantly working together to make sense of the world. Our homework assignments for this class are always quite fun as well: for example, last night I got to play with Play-Doh! I wish I had photos to add to this post, because that’s one of my favourite parts about blogging; alas, I have none. I promise to make up for it in the next post though! I should probably go catch up on homework though…being a senior is no easy task. If you have any recommendations I would be happy to hear them. I had no idea when I decided to come to Erskine how much my appreciation for the fine arts would be cultivated during my time here. Certainly, I knew and appreciated that Erskine is a liberal arts college, and I hope to always be growing to better love the good, the excellent, and the beautiful in life. I didn’t realize, however, what a plethora of incredible musical productions and plays would become suddenly available to me as a college student here at Erskine. Indeed, it seems that almost every other month there is a choral performance, a play, or even an opera of some sort or another, all of which are, without fail, excellent in caliber. various types of music and drama. Even if music and theater aren’t your passion or forte, learning to take joy in the finer things of life is always worthwhile. And if the performing arts are your passion…well, perhaps you should visit Erskine.